How often do you look at the moon and acknowledge its unrelenting, predictable cycle? The moon has eight phases, a lunar cycle takes 29.5 days from new moon to new moon. Many human civilizations, ancient and current use the moon as guide for daily life. Not only does she provide light, she helps us see our dreams to fruition. When we apply these phases to our lives, the most poignant time is the new moon phase, when the dark side of the moon can lend itself to manifest our thoughts and ideas, allowing us a chance to plant seeds and develop roots that can last throughout the month and year. It gives us a fresh start, at a time on Earth when most are so disconnected from the earth and without any ritual that allows us space to heal and connect. The new moon is a time that gives us sacred space to connect and support one another’s dreams and aspirations. Many women hold new moon circles or ceremony, setting and writing down their hearts’ wishes for the new moon cycle. This usually begins with a prayer, an invocation or smudging to clear the space and allow a safe, sacred space to hold our ideas and intentions. Lighting candles represents the light within us and helps each participant focus on the sacredness of the ceremony. You can also light candles according to their color and what each color can represent. For example, yellow for health or white for purity and spiritual awareness. It is important to center ourselves with meditation, some yoga, maybe some herbal tea to relax with while we gather to manifest the next month. As we begin to conspire what is next in our lives, it is nice to affirm what we are asking for and that it be for the greater good of ourselves and those around us. Take a minute to acknowledge your blessings and give thanks for what more shall come. Next it is important to spend time within, to really get in deep with your hearts desires and to identify which manifestations will hold highest priority during this time in your life. Write these down and say a prayer for each one. Keep a list as long as you want, dream big and wide, but keep account of what manifests during this month and modify or add to your list at the next new moon. It’s natural for things to shift and the list to change. You may also keep a running keepsake of your new moon intentions that manifested into reality. I call this my blessings book, so I can recall my spiritual and physical gains by being in practice with the moon. Remember, nothing is too big or small to ask for. You can easily have small and large gains by refreshing your list with each new moon and encouraging other women to participate with you. Write down any desire, large or small, each bit adds to the ebb and flow of blessings you can will into your life. There is great power to be found in sharing circles with other women, supporting their journey and lives. It connects us to other women around the earth and creates a web of energetic support that once you experience it, it easily becomes ritual to lend your light and support to those around you. 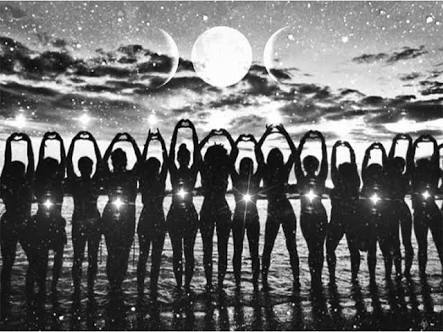 We are powerful alone, every woman, but we are beyond magical when we connect and circle together, manifesting great things for all. Join us tonight August 2nd, at 7pm on the mystical soft white-sand beach of Alaya Tulum hotel to channel your power on this new moon.